Advertising and marketing touches on every corner of our lives, and is the invisible fuel powering almost all media. Complain about it though we might, without it the world would be a darker place. And of all the industries wracked by change in the digital age, few have been turned on its head as dramatically as this one has. We are a long way from the days of Don Draper; as Mad Men is turned into Math Men (and women-though too few), as an instinctual art is transformed into a science, the old lions and their kingdoms are feeling real fear, however bravely they might roar. Frenemies is Ken Auletta’s reckoning with an industry under existential assault. He enters the rooms of the ad world’s most important players, some of them business partners, some adversaries, many «frenemies,» a term whose ubiquitous use in this industry reveals the level of anxiety, as former allies become competitors, and accusations of kickbacks and corruption swirl. We meet the old guard, including Sir Martin Sorrell, the legendary head of WPP, the world’s largest ad agency holding company; while others play nice with Facebook and Google, he rants, some say Lear-like, out on the heath. There is Irwin Gotlieb, maestro of the media agency GroupM, the most powerful media agency, but like all media agencies it is staring into the headlights as ad buying is more and more done by machine in the age of Oracle and IBM. We see the world from the vantage of its new powers, like Carolyn Everson, Facebook’s head of Sales, and other brash and scrappy creatives who are driving change, as millennials and others who disdain ads as an interruption employ technology to zap them. We also peer into the future, looking at what is replacing traditional advertising. And throughout we follow the industry’s peerless matchmaker, Michael Kassan, whose company, MediaLink, connects all these players together, serving as the industry’s foremost power broker, a position which feasts on times of fear and change. 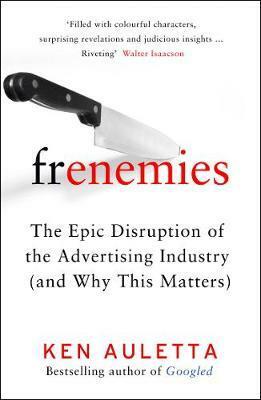 Frenemies is essential reading, not simply because of what it says about this world, but because of the potential consequences: the survival of media as we know it depends on the money generated by advertising and marketing-revenue that is in peril in the face of technological changes and the fraying trust between the industry’s key players.